The longer you race, the harder new PB (personal best) times are to achieve. This is my 10th year racing as a professional triathlete, having raced around 35 full Ironmans. With that background and the fact that I recently accomplished a new Ironman PB a month before my 40th birthday is pretty amazing. I raced Ironman Brazil South American Championships on May 28, finishing in 7th place with a time of 8:16. I swam 51 minutes, biked 4:26, and ran 2:54. Going into the race, I knew I was the fittest I’d been in several years, so it wasn’t a shock at all that was able to put together that race. I wanted to share with you a little more in-depth description of my race. Ironman Brazil is on the island of Florianopolis in Southern Brazil. It’s designated as the South American Championships, which means it has double the professional Kona Qualification points and triple the money. It also means that it attracts a much tougher and deeper professional field than most typical Ironman races. I had been feeling good all race week, both in my general energy level and in my workouts. I knew my taper was kicking in and that I’d done the hard work in training, so with some rest, my body would absorb those hard training sessions. Race morning, as soon as my 3:00 am alarm went off, I drank a bottle of XRCEL. I like to start getting calories in my body as soon as possible on race day. Then I dig into my normal pre-race breakfast of rice porridge, banana, and coffee. Then I took the early shuttle to transition to finish setting up my race gear and did a 10 minute “wake my body up” super easy jog. I took another bottle of XRCEL about an hour before my swim start to continue to the steady all-day flow of calories. After everything was set up, put on the wetsuit and off to the swim start. Right before I jump in for my swim warm up, around 20 minutes before the start, I drank one more bottle of XRCEL, topping up the fuel tank one last time before the day begins. I’ve always said, my least favorite part about my sport of Ironman racing is the time between dinner the night before the race and when I’m 10 minutes into the swim. That 14 hour period is when all of the race nerves, self-doubts, and thoughts of “what if’s” set in. Once I’m about 10 minutes into the swim, I’m well into my groove, there are no more nerves and I’m just focused on executing. Waiting for the start gun is the culmination of that period of time. I’ve now learned to push out the nerves and anxiety in those last few minutes before the cannon and simply focus on executing in the coming minutes. It’s about staying calm and collected, but being ready to move both tactically and aggressively at the swim start. That said, I wasn’t very happy with my swim in this race. Those who train with me know that I traditionally swim much better in training than in races. Ironman Brazil was no exception. I exited the swim well back from where I should have been in the race, but I’ve learned with experience, not to panic or get down on myself. As long as I execute a good bike and run, I can still have a great race. I once came out of the water at Ironman Cozumel in 27th place. Over that day I slowly worked my way up, eventually finishing in 2nd place on the day. So I know that no matter where I exit the swim, I can still have a great day. Brazil was no exception, I was trying to count the male professional bikes left on the rack in transition as I ran through. With a little subtraction of how many male pros I knew were in the race, I figured I was in around 23rd position starting the bike. Getting on the bike, my legs felt good right away. My coach, Julie Dibens, gives me swim-bike brick training sessions periodically to simulate coming out of the swim and being able to start cranking out the power on the bike right away. My goal power for the race was about 260 watts. I race at 140-141 lbs, or 63.6-64kg. So that’s about 4.1 watts/kg power to weight ratio. Of course with the adrenaline of the start of the bike, I started a little hot. I was averaging closer to 270-275 watts for the first 10-15 minutes. It’s not normally a great idea to do that, but I knew from my training that I could do that without adversely affecting my race. After about 15 minutes, I settled back into 260-265 watts, which was perfect. 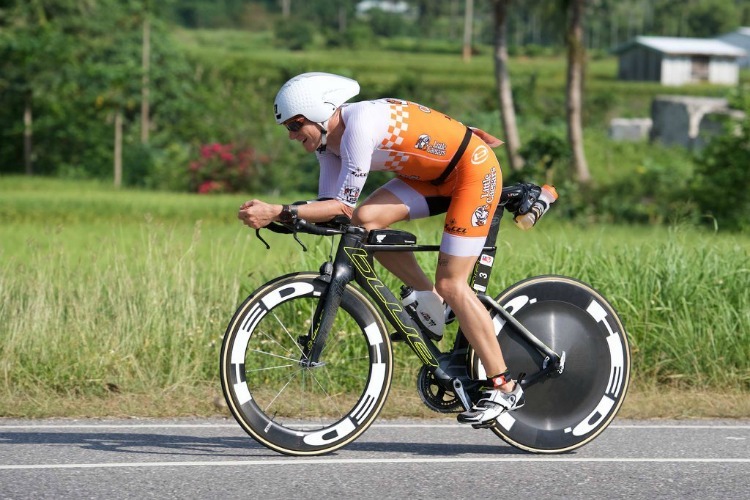 The nice part about Ironman Brazil’s course is that there are quite a few out and backs on the bike and run, so we have the opportunity to see our opponents’ relative positioning frequently. I picked up a few positions in the first 30 minutes of the bike, but I could see I was catching a big group of guys a couple minutes up the road. I finally caught them about 30 miles into the ride. The group had about 7 guys, several of them were very good runners. One item to note about Ironman racing is that we are not allowed to “draft” or ride right behind another competitor. We have to keep 12 meters from front wheel to front wheel, or about 10 meters between bikes. The problem is that even with that gap, as guys get together, even with this “legal” distance between bikes, there is still a drafting effect making it much easier to ride fast. So guys can sit at the back of a group and save 10%-15% of their energy (I’m just guesstimating that number). The guy riding at the front of the group ends up “doing the work” while all those behind him have a bit of a free ride. Some guys use this as their race strategy, to sit in a group, ride easier than they would on their own, then have a faster run because their legs are fresher. It’s perfectly legal and smart. I was afraid this would happen with this group of around 7 guys. I would end up riding on the front and they would stick to me for the next 80 miles. I made a tactical decision to really ride hard to pass the group and pull away. I’d already made up 3 minutes on them in 30 miles, so I knew if they were isolated again, I’d put more time on them. As I passed, I could tell they immediately picked up the pace to try to latch on to me. I’d been riding the best of my life in training, so I knew I had the capacity to put in a hard effort and recover from it. I kept riding hard, until I was able to “break the elastic” as we say. There’s a moment when you can feel the group relax a bit and almost give up chasing you. After I downloaded my power file after the race, it said that I’d done 13 minutes at 308 watts at that time, much higher than my goal power. Maybe that effort hurt my run a bit, but it allowed me to break away and ride my own pace rather than drag along a bunch of good runners. I eventually put another 8 minutes into that group over the next 80 miles. On my own again, I settled back into my pace and power. I passed several more guys throughout the ride. My nutrition felt spot on, having XRCEL in my water bottles throughout the ride. I came off the bike in 10th place about 5 minutes down from 2nd place. My close buddy Tim Don was in the lead, with a HUGE gap. He would go on to break the all time Ironman world record, going 7:40 on the day. Getting off the bike, it was really a race for the rest of the top-10 because Tim was in his own zip code ahead of us. I was happy that I had a PB bike of 4:26 and had made up about 13 positions. Looking at my power after the race, I averaged right at 260 watts, which was exactly my goal. I’ve biked close to that time before, but was so trashed I couldn’t run. This time, however, I was able to get right into my running pace and felt pretty good overall. In the changing tent in transition I quickly sucked down more XRCEL just before exiting onto the run. The memory of almost every Ironman run ends up as a blur. You remember it hurting a lot, you remember it feeling like it took forever while you were in the middle of it, but after you cross the finish line, it almost feels like it went by quickly. The run course in Brazil is flat, with the exception of miles 2.5-3.5 and 7.5-8.5. Those two miles have steep and nasty hills. I really relaxed on those hills and focused on pushing the flats. Just like the bike, with many out-and-backs, I could see who was running well and who was struggling. Other than the two hilly miles, I was holding right around 6:20-6:24 minutes/mile pace for the first 18 miles or so. My goals was to run around a 2:48 marathon, but because the run comes last in an Ironman, all of the fatigue, decisions (and mistakes), and variables from the whole day all compound. My pace really started dropping around the 20 mile point. I passed four guys on the run, with one of them passing me back around mile 20. I really struggled at the end. It wasn’t energy or nutrition, I felt fine systemically. It was 100% quad fatigue. My legs were just really sore, it’s as simple as that. The last out-and-back was at mile 23, so I lapped my watch to see how far the next guy was behind me. I was in 7th place, with 8th about 3:20 behind, so I knew I just had to hold steady and not blow up to hold my position. The last few miles is just a matter of gutting it out. I finished the race happily in 7th place in 8:16 at a Championship race. Even with my “fade” I ran a 2:54 marathon. I take that result. I’ve now recovered from Ironman Brazil and back into my training grind. When you have a great race, it’s important to enjoy the moment and acknowledge the success for your hard work. But it’s not healthy to dwell on it for too long. There’s always lessons to be learned, more work to be, done and improvements to be made. I know I can make more improvements from this race and am looking forward to continued growth in this wonderful sport.